The video of the speech was shared by the official handle of Delhi Capitals on their page. "When the coach speaks, we listen,” read the caption of the video. The video was shot after team DC finished their day in the nets. 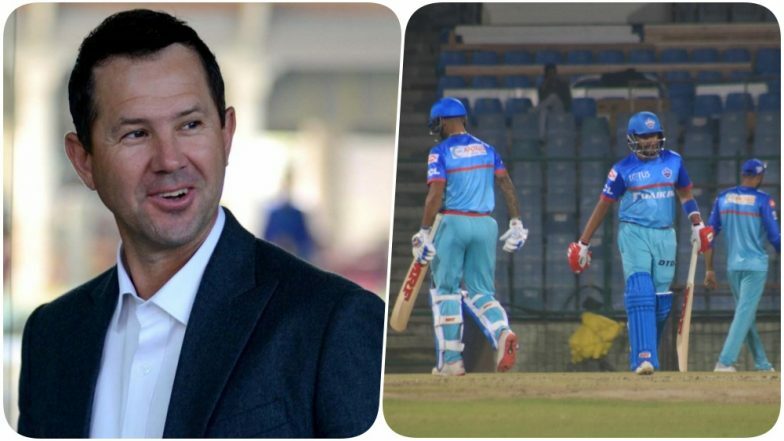 In the video, we hear Ponting talking about how the players have been focused and have stuck to the plans. He also stated that the last training session will be short and will start with a football session. Mumbai Indians vs Delhi Capitals Live Cricket Score 3rd T20 Match. Yesterday, we told you that during the nets of Delhi Capitals and Mumbai Indians, Sourav Ganguly who recently joined the team as an Advisor met Yuvi. The video of the chat between the two players was shared by the official page of the Mumbai Indians. The former Indian captain then advised Yuvi to play like himself. The match between the two teams is said to be an exciting one as both teams would want to have a winning start to IPL 2019.